1. 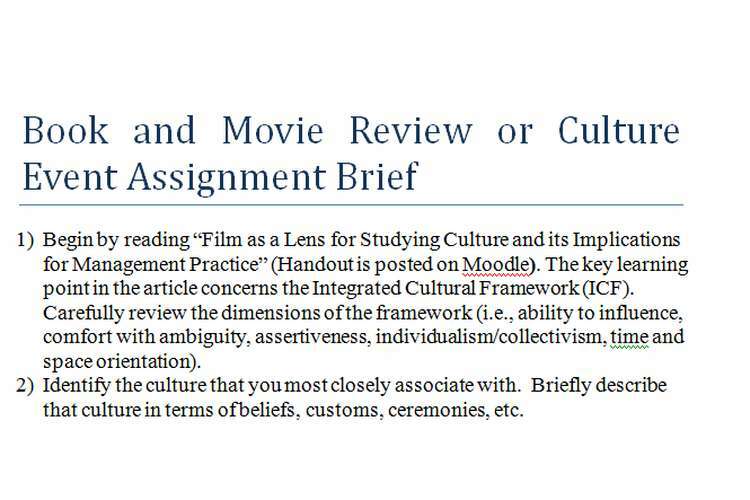 Begin by reading “Film as a Lens for Studying Culture and its Implications for Management Practice” (Handout is posted on Moodle). The key learning point in the article concerns the Integrated Cultural Framework (ICF). Carefully review the dimensions of the framework (i.e., ability to influence, comfort with ambiguity, assertiveness, individualism/collectivism, time and space orientation). 2. Identify the culture that you most closely associate with.Briefly describe that culture in terms of beliefs, customs, ceremonies, etc. 3. Apply the six dimensions of the Integrated Cultural Framework model to your own culture, using the reading “Film as a Lens for Studying Culture” and the Integrated Cultural essay or Framework chart. Briefly describe your findings. 4. Choose one film from the list below, or a book on another culture.Select a book or movie on a culture other than your own. If you wish, you can choose an international film or book not on the list below, however, please contact the instructor for approval.Briefly describe the culture in the film in terms of beliefs, customs, ceremonies, etc. 5. Apply the six dimensions from the ICF to the culture represented in your film.To carry out the analysis select a lead character or a specific group identified in the film and apply the ICF (e.g., to what extent did you observe the lead or the groups’ ability to influence in situations portrayed in the video). The purpose of the paper is to help you understand and apply the ICF.Each of these films can be analyzed from a number of perspectives—there is no best answer.Again, the primary learning objective is to enhance your understanding and use of the ICF. Please, do not summarize the contents of the film; discuss only the link between the video and the ICF.The grade is based on the extent to which you are able to explain the relationship between scenes in the film and the ICF. 6. Conclude with a brief discussion on the similarities and differences between the two cultures.